The whole group moments before the Plunge. Earlier today, our very own Sheida Sahandy plunged into Puget Sound in celebration of the new No Discharge Zone. 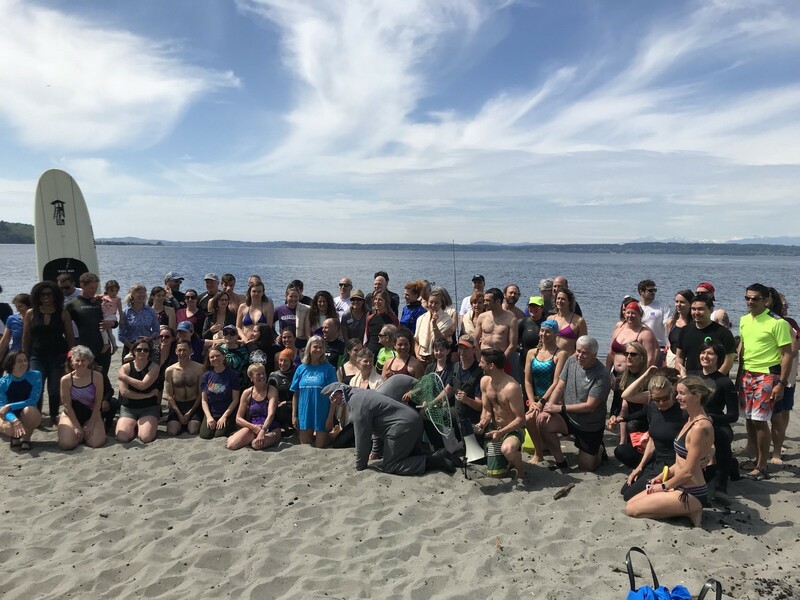 This morning at Golden Gardens Park in Seattle, Ms. Sahandy and her fellow plungers gathered and spoke in anticipation — and possibly slight dread — of jumping into cold Pacific waters. It was an inspiring event filled with stories of personal and professional success in Puget Sound recovery. 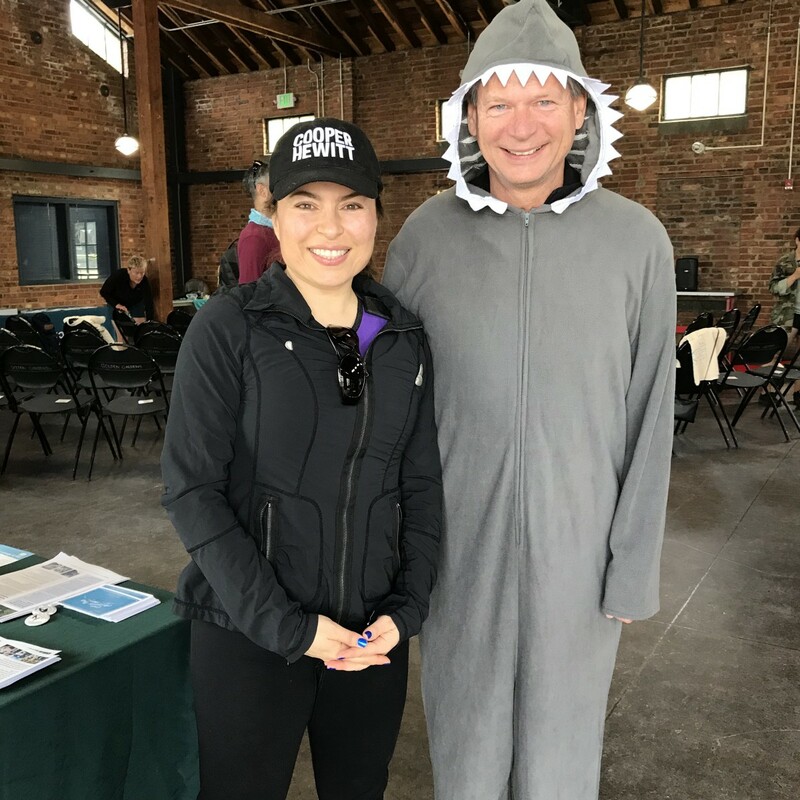 Executive Directive, Sheida Sahandy, and Ecosystem Recovery Board Chair, Will Hall, before the Plunge. When the Department of Ecology signed Puget Sound’s No Discharge Zone — or NDZ — into law last month, it was met with mixed reactions. Many Washington residents were surprised that Puget Sound wasn’t already an NDZ. Puget Sound represents a large contribution to the identity of the Pacific Northwest; it’s often depicted as a shimmering body of beautiful water that, on the surface, appears healthy. So the idea that up until now vessels could release sewage — treated or not — into our beloved Sound came as a bit of a surprise. But with nearly 100 No Discharge Zones nation-wide, Puget Sound joins the long list as the first NDZ in the Pacific Northwest. Six long years of patience and perseverance led us here today. The excitement to run into the chilly waters of Puget Sound could be felt on the shores of Golden Gardens. Tackling controversial issues isn’t easy, and the road to recovery can sometimes feel like it will never end. But successes like this are an important piece to the big puzzle that is Puget Sound recovery. “What we celebrate today… is not only an outcome but the triumph of patience [and] perseverance”, said Ms. Sahandy. At the Partnership, we’re proud of our culture of collaboration that facilitates constructive conversation and effective decision-making. The Action Agenda is our region’s plan for recovering Puget Sound, and this NDZ has long been included as a line item. The Partnership has advocated for this NDZ every step the way. That’s planning, that’s patience, and that’s perseverance. Those who worked to make this NDZ a reality recognize that everyone has a unique perspective to bring to the table, and the discussions over the NDZ were no exception. Alongside Ecology, we listened to those who opposed the NDZ, and stood strong with Ecology while they learned about other views and perspectives. And together we supported a phased approach that would make adopting the NDZ easier. Patience and perseverance are methods of success that we employ all the time. At the end of this month, we will be travelling with our partners to Washington, D.C., to meet with federal decision makers, show them our region’s innovative approaches to Puget Sound recovery, and urge them to continue to support robust and full funding for our hometown estuary. Puget Sound Day on the Hill will take plan on May 23, 2018. Click here for more information, and please consider adding your electronic signature to the Letter of Support for federal funding of Puget Sound recovery (read here and sign here).